(St Georges, Grenada)- Long-time J/sailor, Hilary Noble, has been on the pointy end of many top teams over the years in J/24s, J/70s, J/105s, and J/88s. This past week, she was down in the Caribbean sailing in the first major event of the winter season “down island”- Grenada Sailing Week. Here is her report on the proceedings. “The Caribbean racing season is now underway with the 6th edition of Grenada Sailing Week that was held from January 28th to February 1st. A record fleet of 40 boats gathered at Port Louis Marina, and it being my first year racing in this event, I was really excited to see what this so-called “friendly island” was all about. Just as I expected, the competitors brought their A-game and race officials and volunteers had one goal in mind: great racing, hospitality, and tons of fun! Racing began on Monday, on the south end of the island just west of the airport, off the pristine Grand Anse beach. Local knowledge played a key role in staying in pressure and setting up for what new pressure was to come. Most of the local teams played the shoreline often, giving them the famous “elevator lifts” to easily one-tack the top end of the race course. We had one hell of an epic takedown with the wind howling and waves crashing on our port side, we got her in and we were headed uphill, keeping an eye out for the next mark. We hadn’t seen the other end of the island yet and WOW, she was beautiful. Finishing off the point of Prickly Bay, I thought to myself, after the salt water shot under my sunglasses, this just doesn’t get any better! The Caribbean circuit is unlike any other racing circuit in the world. Sailors from all over the world come to experience new cultures, taste the amazing food, and make new connections. For most, it’s a vacation in itself. Living in Rhode Island these days, I appreciate the aspects of warm-weather sailing more than I ever have before. Living it up and enjoying their entire week was a well-known crew from Antigua, Pamala Baldwin’s J/122 LIQUID. Sailing in the largest class of the event, the thirteen-boat CSA Racing Division, Pamala and her crew sailed by far the most consistent series of any boat on the water. LIQUID’s worst race was a 4th (their toss race) and all the rest were 1st, 2nd, and 3rds, finishing on the podium to take the silver in their first outing in the Caribbean winter circuit! Meanwhile, one wonders if it was a case of sheer joy or pure exhaustion for the half-dozen J/24s that sailed off St Georges for the entire regatta. After eighteen races (!) it was quite apparent that the top of the leaderboard was going to be determined by a “war of attrition”. In the end, Fred Sweeney’s ATTITUDE from St Lucia never broke down, never lost focus, and never finished worse than 4th place! Amazing! Consequently, ATTITUDE maintained the pressure on the fleet after winning the first three races to take the J/24 crown. Second was Robbie Yearwood’s DIE HARD from Grenada; posting nearly as many 1sts, 2nds, 3rds as Sweeney’s crew, but not nearly enough, settling for the silver. Rounding out the podium was Stephen Bushe’s HAWKEYE from Trinidad, taking the bronze- a truly international podium. Thanks for contributions from Hilary Noble and Scuttlebutt Sailing Newsletter. 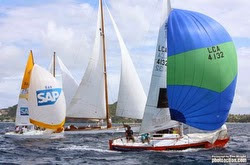 Follow Grenada Sailing Week on Facebook here For more Grenada Sailing Week sailing information Add to Flipboard Magazine.